Hamtramck, a city surrounded by Detroit, is home to a large Polish community that formed when the Dodge Brothers opened a plant in 1914. Many bakeries there and in the Metro Detroit area are cranking out large amounts of paczki for Fat Tuesday, the day before Lent begins. The American Polish Cultural Center in Troy sold paczki yesterday and will continue to sell all day today. Marc picked these up yesterday and he said a group of Polish ladies with perfectly coiffed hair made the paczki and handled the transactions. They offer raspberry, cherry, custard, prune, apricot and were out of hibiscus, which is said to be traditional. Marc picked up a bunch of custard and a few apricot and prune. As you can see in the photo above, the lady on prune duty was a bit skimpy with the filling. That little speck was all of the prune we got, but it was a delicious speck! You can get paczki around here in pretty much any grocery store bakery for Fat Tuesday and I haven’t been too crazy about that type. We tried the cultural center this year for something fresher and we were really pleased. The inside of the doughnut was soft and the outside was golden brown. The fruit-filled variety had a wonderful crunchy powdered sugar top, but the glazed custard was my favorite. Today is also Mardi Gras Day and Shrove Tuesday (or pancake day), which is celebrated in the United Kingdom, Australia and Canada. Do you have a tradition you celebrate today? 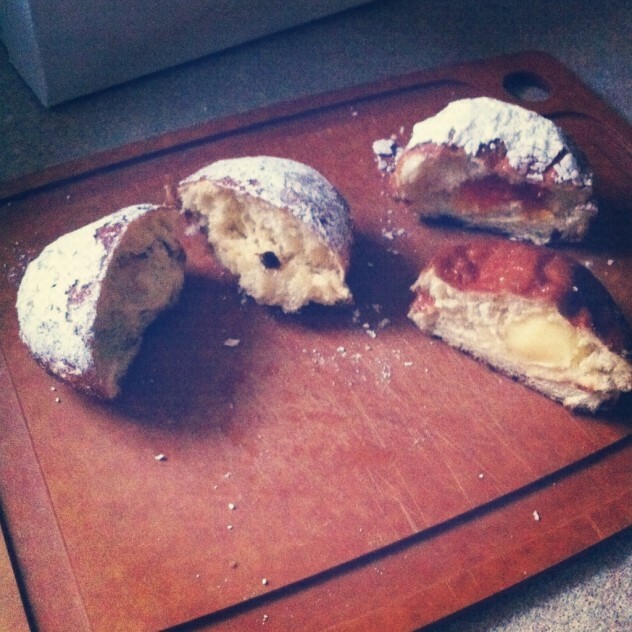 I had to look up Paczki weekend as I kept seeing/hearing about it all over town and the internets…then Sean and I set about trying to figure out the pronunciation. I have to say, I can’t hate a day that is dedicated to doughnuts! Nancy – Enjoy your raspberry paczi! I love this yummy bread, but I have no traditions associated with it, really. Does buying it to gorge upon count as a tradition?! Robin – That definitely counts as a tradition! I just saw this post today. Raspberry paczkis make life worth living. In sad news, that was the last thing I got from my favorite bakery here in Kalamazoo before it burnt down this weekend! 🙁 So sad!